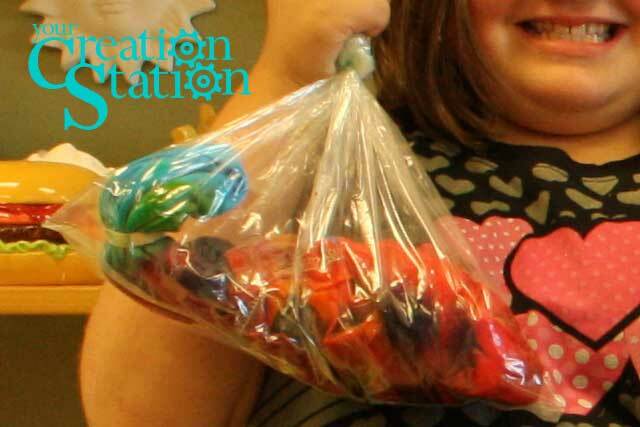 Here’s a quick and easy guide to washing out the tie-dye you made at Your Creation Station. We use professional grade, cold-water, fiber reactive dyes in our studio so the colors will remain color fast and bright for many, many washings. 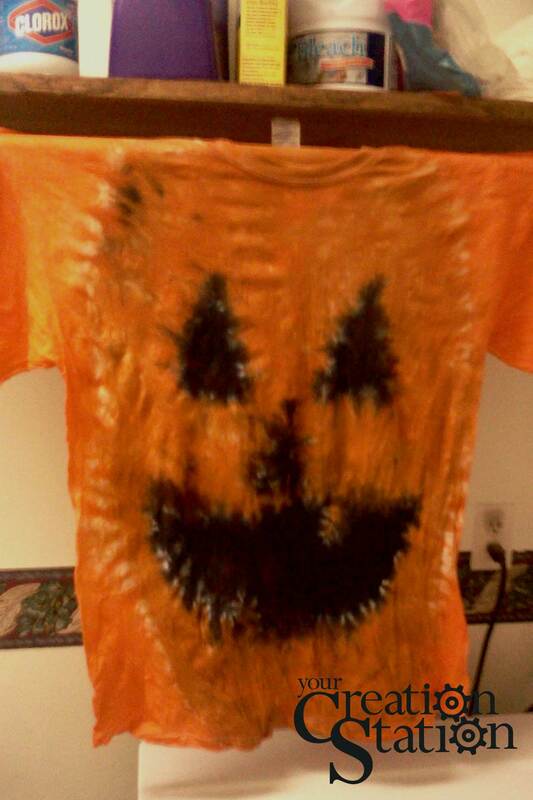 The first step to completing your tie-dye is to let your shirt (or dress, bag, scarf, towel, etc.) soak for AT LEAST one hour. The longer the better, I let mine sit overnight and recommend you do the same. 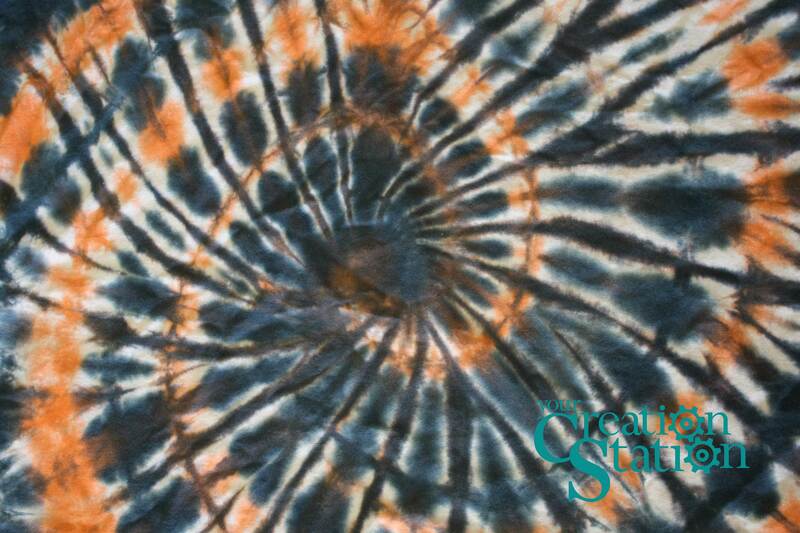 By letting it soak, you are giving the dye time to react with and stain the cotton fibers from the inside out. The fabric needs to stay wet for the reaction to happen so the best thing to do is leave the fabric in the bag it came home in until you are ready to wash it out. Keep your tie-dye in the bag you brought it home in until ready to wash it out. Once your ready to wash the fabric out (or you just can’t wait any longer to see how it looks) open the bag up in a sink, or tub or somewhere that you can easily clean and won’t be ruined if some dye gets on it. I generally use my kitchen sink. Take the fabric out of the bag, remove all the rubber bands and/or thread used to tie the design, unfold your tie-dye and take a look. At this point, I generally rinse the shirt with water, first cold, then warm and then hot. Rinse a couple of times at each temperature until the water runs mostly clear. I’ve found there is no hard and fast rule for how long or how much to rinse before washing and I’ve had equal success running the whole gamut of rinsing a lot to not rinsing at all. Weather you choose to rinse out the unreacted dye or not, you will need to wash your tie-dye before using it. Put the tie-dye in a washing machine, WITH NOTHING ELSE YOU WANT TO GET DYE ON, and wash the fabric, with soap, as you normally would. If you have more than one tie-dye to wash its OK to them together. Although I don’t recommend doing it this way, I wash all my cloths, colors, whites, old tie-dyes, new tie-dyes, or whatever, together in cold water and everything comes out fine. Once the fabric has been washed, its ready to wear and can be washed and dried with your regular laundry. 1 Pings/Trackbacks for "Washing Out Your Tie-Dye"
Want us to make a shirt for you? Click the "Select Options" button below, choose your size, design and colors and we'll send you the finished shirt.